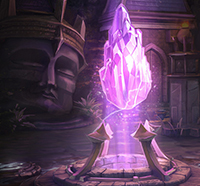 Vainglory’s first mage has arrived in the Halcyon Fold. Every thousand years returns Skaarfungandr the Vehement, His Dreaded Majesty, the Indomitable and the Eater of All. The stories speak of a massive, ancient dragon capable of incinerating entire civilizations at will. Yet, with the dragon’s “return” comes a rebirth of sorts. 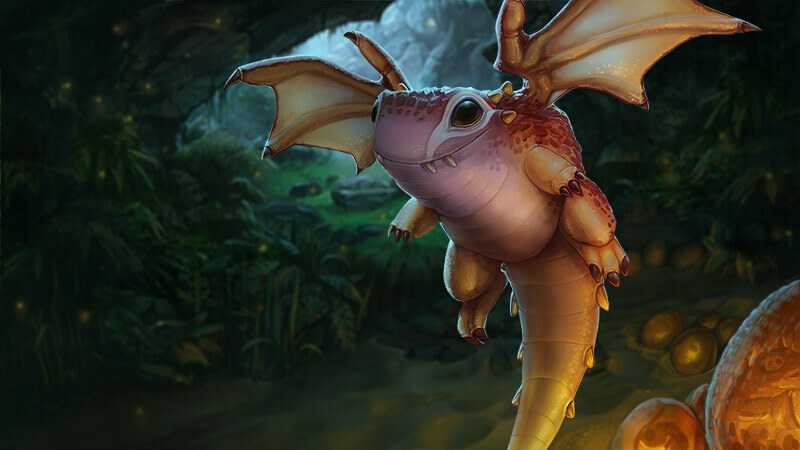 During the most recent official Friday livestream, you met Skaarf for the first time — a little dragon recently hatched and still growing … with a long way to go until he reaches the size of the mythical dragon that is his namesake. Skaarf might not be ready to raze whole cities, but he’s still a deadly little flamethrower in the Halcyon Fold. Skaarf thrives at dealing long-range and area-of-effect damage, especially during teamfights. But keep in mind that his abilities are aimed—meaning you’ll need quick reflexes and good prediction to land those fireballs. Start Skaarf in the lane and burn your way to glory. Skaarf’s fire-based abilities light the target ablaze, burning enemies for 3% of their max health for 3 seconds. Skaarf’s basic attacks and fire abilities will refresh the burn duration. Each of Skaarf’s basic attacks will also increase the damage of the burn by another 3%, up to 12% per second. This fire does not burn turrets and deals reduced damage to Kraken. Skaarf spits a fireball that deals crystal damage to the first enemy or creature in its path. Skaarf hurls goop onto the target location. Enemies walking through the sticky substance are slowed. Skaarf’s fire abilities will set the goop ablaze with a burst of damage that extends slightly beyond the gooped area. Once aflame, a gooped location will not slow but will apply damage over time. Skaarf inhales deeply for 1.5 seconds, slowing fleeing enemies and accelerating closing allies. Skaarf then exhales flame for 3 seconds, incinerating enemies in a cone in front of him. While exhaling, enemies moving against the flame are slowed while allies moving with the flame are accelerated. Skaarf may move freely while spewing fire, but he cannot basic attack or use other abilities. Until now, the best you could do was invite three friends to a party, enter the queue and take your chances in the wild—hoping the Matchmaker gods shined favorably upon you. No longer. Now, you can invite all six players to a party and pick your own 3v3, friends vs. friends teams. This is your means to securing ultimate bragging rights among your friends and family and the Vainglory Community at large. Take on the best of the best in prearranged matches. Organize your own tournaments. It’s all now in your hands. From the main menu, select Party. Invite up to 6 players. From there, you’re all temporarily placed on the same oversized team. Players need to use the Switch Teams button until you’ve organized your desired 3v3. If you fail to even out the teams, they’ll be evened out for you randomly. Because of the potential for “gaming the system,” private matches will not grant Glory or Karma, although we’re examining ways of rewarding this style of play without consequences unfair for everyone else. That makes this form of play largely for prestige and ultimate tests of skill. We expect (and recommend) most players utilize the full 3v3, but you’re not limited to that format. Are you way more experienced and skilled than your younger siblings or the friends you just brought into the game? You can kick off a 2v3 … or even a 1v3 if you really want to stack the deck. If you’re still stomping after that, you might want to try playing with your toes. Looking forward to seeing some screenshots posted in the forums of epic 1v3 and 2v3 disadvantaged wins. This update bakes in Chat Phase 1: Parties. You can chat while forming a party, and you can chat while queuing as a party. This will greatly aid the forming of coordinated teams for public and private match play. While this chat is in update 1.1.5, it’s likely not turned on for you yet. We will be activating chat region-by-region (much like the global launch rollout), observing both the behavioral and performance impact. Follow us on Twitter and check the forums for updates on when chat will be live in your region. No topic (other than dealing with AFKs) generates quite the passion of chat. Some players want every opportunity to communicate in every medium possible, while others like some communication restraints to limit distractions. Then there’s the folks understandably worried about toxicity and negativity, many of whom have been burned before (or realize they have a dark side where they rage against inferior players). Our team is extremely sensitive to these concerns. We will be watching and listening and factoring your input into what comes next. Mark your victory (or defeat) with an epic Vain shatter. Each base has its own explosion. Go check it out! Letting the timer run out on Hero select because you didn’t get your first choice is not okay. It wastes the time of the other five players, and ultimately, Vainglory is a team game. Players need to show a little flexibility, and if you’re only comfortable with a single hero or position, it’s likely time to branch out anyway. From now on, players who cancel a match by choosing to not lock in a hero will receive the same “cooldown” penalty as failing to accept a match. You may now manually aim Thunder Strike independent of Joule’s facing direction. Range increased from 6 to 7 to match visual effect. Stacks are no longer lost upon being stunned. Moving Mad Cannon’s power to crystal builds. Mad Cannon no longer deals any weapon damage. Base damage is now 150/225/300 crystal damage per shot with splash. Crystal ratio increased from 100% to 120%. Missing health % damage reduced from 20% to 15%. Each time Stormguard deflects damage, the damage cap will no longer weaken by 1.5%; instead, the duration of Stormguard will shorten by 0.5 seconds. Takes longer to heal the same amount. Heal duration increased from 3 to 4 seconds; total heal is the same. A miner you won’t outclass. The Gold Miner gains health, armor, shield and damage about ~33% faster than before. Go play Skaarf, explode some Vains … and let us know in the forums what you think of all the new stuff! Free Hero Rotation (March 13): Try Lyra, Skye, Ozo and more! 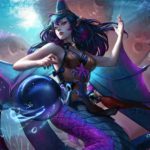 Free Hero Rotation (June 19): Try Lorelai, Petal, Kestrel and more!